A hydrating conditioner with the superior emollient qualities of natural oils. Lightly scented with soothing notes of hibiscus flower, the Red Hibiscus Conditioner nourishes your hair cuticles and moisturizes your scalp – giving you smooth, silky, and manageable hair. 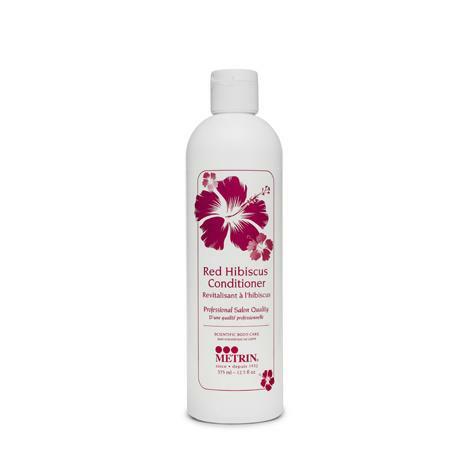 The Red Hibiscus Conditioner is effective for all hair types, including chemically-treated or colored hair. While the Red Hibiscus Conditioner is effective on its own, we recommend using it with the Red Hibiscus Shampoo for best results. Distribute a small amount of conditioner onto hands, work through hair from scalp to ends. Leave on for one to two minutes, then rinse. For problem hair. follow above precodures and let conditioner remain on hair for a few more minutes, then rinse. For optimum results, use after our Red Hibiscus Shampoo. Water, Centrimonium Chloride, Cetyl Alcohol, Stearyl Alcohol, Dimethicone, Isopropyl Myristate, Phenoxyethanol, Methylparaben, Butylparaben, Ethylparaben, Isobutylparaben, Propylparaben, Hibiscus Fragrance.